← Have Church/State Leaders Endorsed Injustice? Secretary of State John Kerry has delayed his fifth “peace process” trip to Israel/Palestine. The Secretary will remain in Washington to attend strategy sessions on Syria. The delay in starting his fifth trip should give Kerry time to add the writings of George Orwell and Rashid Khalidi to his Tel Aviv flight reading assignment. The Washington strategy sessions on Syria which delayed Kerry’s trip, were hastily arranged after a major military encounter at Al-Qusayr, Syria. Hezbollah, which the New York Times recently described as “the powerful Lebanese Shiite Muslim organization”, (eschewing, surprisingly, the usual pejorative media phrase: “which Israel and the US consider a terrorist group”) joined President Bashar al-Assad’s regular Syrian army forces in a major military victory in the Syrian civil war. 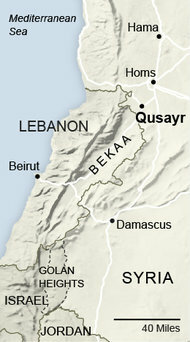 Here is how the Times reported on that battle in the city of Al-Qusayr, which as the map above reveals, is a crucial border crossing point between Lebanon and Syria, which is a matter of considerable interest to Israel. Al-Qusayr complicates John Kerry’s task as a peace envoy when next he travels to Tel Aviv. The “peace process” of which this next trip is just the latest episode, has been built on decades of deceit. Increasingly, that deceit has been exposed for all to see and, except in Israel, lament. Syria’s and Hezbollah’s victory at Al-Qusayr leaves the US uncertain on what to do next in Syria in a civil war in which Israel and Palestinian loyalties are in opposition. Which side are we on, Mr. Secretary? As the latest in a long line of US peace envoys stepping into the Middle East quagmire, Kerry will be required to carry out his unpleasant assignment of “defending the indefensible”, when he claims he is negotiating between Israel and Palestine in “good faith”. “Defending the indefensible” is the phrase George Orwell used 67 years ago in his important 1946 essay, “Politics and the English Language”. That phrase stands today as harsh judgment of decades of deceit by US diplomats who claimed an “honest broker” role in peace negotiations. Orwell’s essay was published between the publication dates of Orwell’s two major books, Animal Farm and 1984. Thus political language has to consist largely of euphemism, question-begging and sheer cloudy vagueness. Defenseless villages are bombarded from the air, the inhabitants driven out into the countryside, the cattle machine-gunned, the huts set on fire with incendiary bullets: this is called pacification. Millions of peasants are robbed of their farms and sent trudging along the roads with no more than they can carry: this is called transfer of population or rectification of frontiers. People are imprisoned for years without trial, or shot in the back of the neck or sent to die of scurvy in Arctic lumber camps: this is called elimination of unreliable elements. Such phraseology is needed if one wants to name things without calling up mental pictures of them. The “peace process” which John Kerry has continued on his previous four trips to the region, is best understood in Orwellian terms as a “euphemism”. In this case the euphemism refers to a series of meetings which have been held for several decades, meetings which were never intended to produce peace, nor to move forward a process. Instead, the “peace process” charade has provided Israel with a smokescreen behind which succeeding Israeli governments claimed “security” as justification for their expansion of Israeli settlements on occupied Palestinian land. Rashid Khalidi’s book, Brokers of Deceit, which should be in the Kerry backpack on his flight to Tel Aviv, traces the history of Israel’s dominance over Palestine, a dominamce aided and abetted by the US. The central theme Khalidi develops is that “the United States has never really operated as an honest broker between the Palestinians and Israel”. This is exactly what secretary Kerry should be reading as he flies to Tel Aviv. has ended up operating as ‘Israel’s lawyer.’ These are the apt words of Aaron David Miller, who as one of the lead [US] negotiators with the Palestinians for many years, was a key participant in this charade. Together with senior colleagues like Dennis Ross and Daniel Kurtzer, he features repeatedly in the pages that follow. From Camp David in 1978 onward, the United States posed as an unbiased intermediary between israel and the Palestinians, but in fact it operated increasingly in defense of Israel’s interests, and to the systematic detriment of those of the Palestinians. All of this dissembling was cloaked in high-sounding but dishonest language. 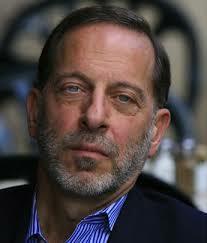 Khalidi’s book is especially timely this summer as Barack Obama moves forward into his second term. Since January, it is not encouraging that the President has made foreign policy decisions more as an empire builder than as a change agent. The president who promised change has been revealed as running a White House that veers dangerously close to becoming a Bush III administration. It is still too early to determine if the Obama-Kerry team will break with past administrations and stand up to Israel’s domineering role not only in the Middle East but also in US domestic politics. In this regard, US actions following the Syrian strategy sessions will be revealing. Will Israel be allowed to push the US into greater involvement with the Syrian rebels? Or will Obama cautiously continue to provide only limited help to the rebels? If I have succeeded [in this book] I have shown how in American political discourse, lies about Palestine are made to sound truthful; how crimes—against a people and against humanity—are made respectable; and how the pure wind of terms like ‘peace process’ are given the appearance of solidity. If Secretary Kerry will read George Orwell’s 1946 essay on political language, along with Rashid Khalidi’s book on this nation’s history of deceit as a so-called “honest broker”, the Secretary will find that the Orwell-Khalidi duo will bring him greater wisdom, and just maybe more peace of mind, than all those State Department briefing papers his staff will have crammed into his carry on. To add to the Kerry reading assignment, Rashid Khalidi has a May 23, 2013 essay which he wrote for the Middle East Channel of the Foreign Policy web site. Firstly, there has to be a US willingness to consider the views of other consequential actors where the Palestine issue is concerned, from Europe and Russia to China, India and Turkey, and including countries farther afield like Brazil and South Africa. After three and a half decades of failed efforts to broker an Israeli-Palestinian settlement, going back to the 1978 Camp David Accords, the United States is in no position to insist on monopolizing peacemaking, or to claim that it is the only party qualified to offer constructive proposals. Indeed, the enforced closeness between the US and Israeli positions on all substantive issues where Palestine is concerned (originating in a confidential 1975 pledge from President Gerald Ford to Israeli Prime Minister Yitzhak Rabin) makes the United States unfit to serve as an intermediary on this issue. Secondly, all concerned, including the United States, must insist that a solution be grounded in first principles like international law, the Geneva conventions, and U.N. resolutions, and in basic notions of equity and comparable human, national and political rights for all. This is necessary whether or not this pleases Israel and its claque in Congress and the media. A just and lasting settlement cannot result from inherently skewed frameworks concocted mainly to meet Israeli desiderata like the Madrid and Oslo formulas, and all of their deformed offspring. Indeed, these very formulae have produced the abysmal situation that worsens daily in Palestine. As Secretary Kerry has said himself, there is only a small window of opportunity remaining for Secretary Kerry and President Obama to place their stamp on the complexities of the Middle East, much of which are the responsibility of earlier US administrations. The flight to Tel Avi is a long one. But if Secretary Kerry will read the Orwell and Khalidi assigned material, he will emerge a stronger and wiser Secretary of State. This entry was posted in Human Rights, Middle East Politics, Netanyahu, Obama. Bookmark the permalink. Thanks, Jim. This is an outstanding analysis of the continued deception, referred to as, “the Peace Process”. I am afraid that Israel’s land grabs and settlement building and continued expansion have already destroyed any potential Two-State solution. Facts on the ground simply make it virtually impossible to implement. No land swaps will come close to equalizing any potential formula. Palestinians cannot wait for one more year of this charade. What is needed is a totally different US strategy that safeguards US, not Israeli, interests. Meantime, several powers are eyeing the vacuum, such as, China, Russia, Iran, Turkey, to name a few. The US Administration needs to make up its mind whether it wants to regain its economic-political interests and stature in the Middle East, or undermine US interests for generations to come. One could be excused for thinking that the cause of justice for Palestine is completely lost when realizing that on May 22nd 99 US Senators voted Yea on the pro-Israel Lobby-composed S. Res. 65, a measure of US subservience to a foreign entity perhaps rarely matched in the nation’s history. Think about it. Erstwhile friends of justice like Tammy Baldwin and the two Vermont lions, Leahy and Sanders, cravenly genuflecting before the altar of Zionism. I’m in despair, believing that this vote marks a very dark watershed moment. I’m compelled to paraphrase the famous quote directed at Shoeless Joe Jackson at the time of the 1919 Chicago “Black Sox” scandal: “Say it ain’t so Bernie”. Thank you Jim for an excellent article saying it all. The time will come when Mr. Kerry will realize that Israel has no interest in peace, and his shuttle trips will come to an end like his predecessors. Mitchell certainly caught on much quicker than others. We have been telling the world, it is a bull, but they insist that we milk it. You strangle us [for decades] and then you criticize us for the way we breathe. P.s. My opinion is that it took Senator Mitchell all too long to realize that, in facing militant/political Zionism’s evil intentions and actions, he had met his match. By “Zionism,” of course, I include not only the present masters of the psychotic ideology in Israel but its Israel-first adherents in the US and around the world such as Dennis Ross, Douglas Feith, Elliott Abrams, Paul Wolfowitz, Eric Cantor, Chuck Schumer, Alan Dershowitz and on and on and on. Thanks for this frank and accurate description of the Israeli intention of taking over the whole west bank. They gained their land by criminal means and hold on to it thus. It is good to read the triuh, but how can we change this Israel bias? Is there any plan to put Israel in its place (double entendre not intended) What will force U.S. to consider their own crime in aiding the crime of the Israeli policies?